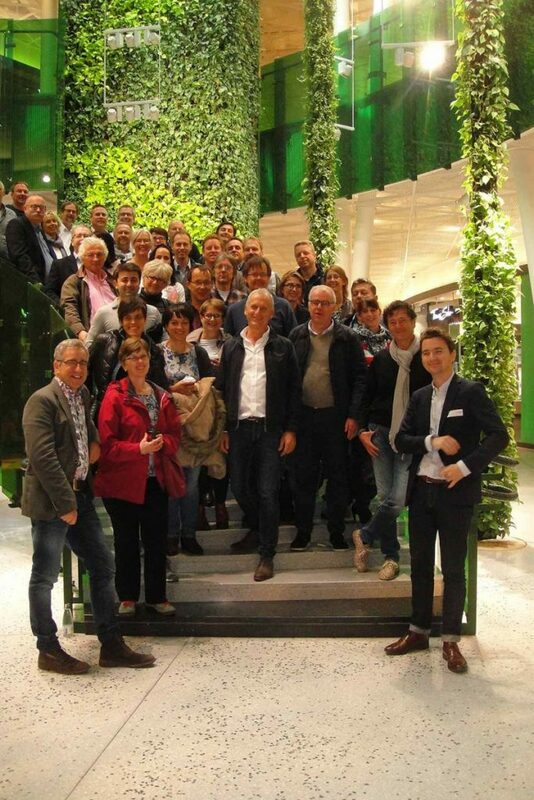 This excursion is the perfect opportunity to see nice projects realized by your European colleagues (not your competitors), discover new products and share ideas about Interior landscaping in general. It’s also the moment to reflect on the future evolution of our businesses. How can our Green industry take advantage of these new developments and markets? Will we soon deliver planters with a USB connection where the plant will upload you cell phone or computer? Will we grow and maintain vegetables and herbs in office spaces? Will plants be able to clean more air by the use of more sophisticated planters? “Yes we can” or “Wir schaffen das” that’s what Obama and Merkel say! We have the great fortune to work with a natural product, which has not only a decorative value but also acts as a natural clean air machine. Combine this product with some brains, a good marketing mix, a lot of work, passion, curiosity, motivation, learning and taking care of your employees and clients = and you have got the perfect mix to be successful! Our green industry does more than just delivering green plants with a maintenance contract. With this philosophy in mind, we will have three interesting speakers this afternoon. Naturvention : who will explain us about natural green intelligence combined with the latest technology to be able to breathe healthier indoor air. Spiio: who will introduce a technology that makes it easier to follow- up your green wall maintenance. Greenfortune : who will tell us about products and projects in the field of Urban cultivation, plantwall and plantwire. After a little break some of our suppliers will give you an update of their products/activities. It’s always good to refresh the memory. in2017, again the Awards will be handed out. So please, send us your best projects, both large and small are welcome. It is the creativity and innovation that counts. For our next seminar we will probably join forces with our German colleagues during the World Green Infrastructure Congress from 20 till 22 June in Berlin. We still work and participate closely with Into Green to promote our industry. At our request we have now articles in French/German and English. By the end of the year the EILO office will move to Brussels, to join forces with ELCA. We still will be independent but it will give us the opportunity to organize some events together to promote the industry. Our clients are nearly the same! We are working on making our website more dynamic, as well as the Facebook page. Our 4 monthly newsletter is sent out to approximatively 1000 people. And of course we need your support, as we’re a non-profit organization. To end this speech, I want to give a special thanks to Marc Custers, who handles all the administration, and Ola Weister for the invitation here in Copenhagen. I want to thank you all for being here, and I hope you will return home full of new Green ideas, and we look forward to see you in Berlin next year.